The Korg Gadget app for iPad is a “mobile synthesiser studio“. It “offers a collection of 15 different synthesisers and drum machines called “Gadgets” which you can freely combine to produce powerful electronic music.” (Korg 2015). The app is definitely on the upper end of the price scale as far as iPad apps are concerned, costing £29.99. In my opinion the app offers incredible value for money for what is essentially a mini Reason/Ableton Live hybrid, one that you can carry everywhere with you. 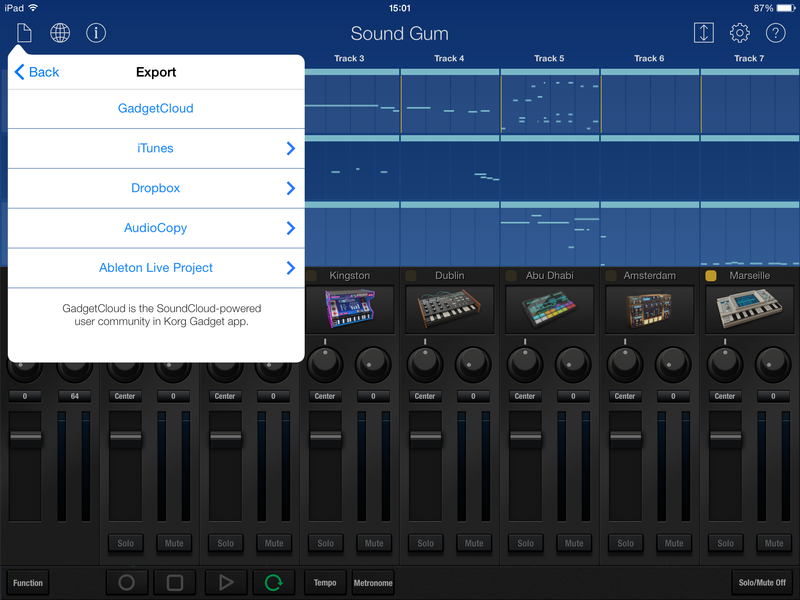 If you love creating music and buy one full price app for your iPad – just get this one! It was App of the Year 2014 in Apples Japanese app store, but seems to have slid under the radar in the UK. I have to admit I’m surprised it wasn’t featured in any of the UK app store curated selections in 2014. Gadget appears to be a lot bigger in Japan, and deservedly so. 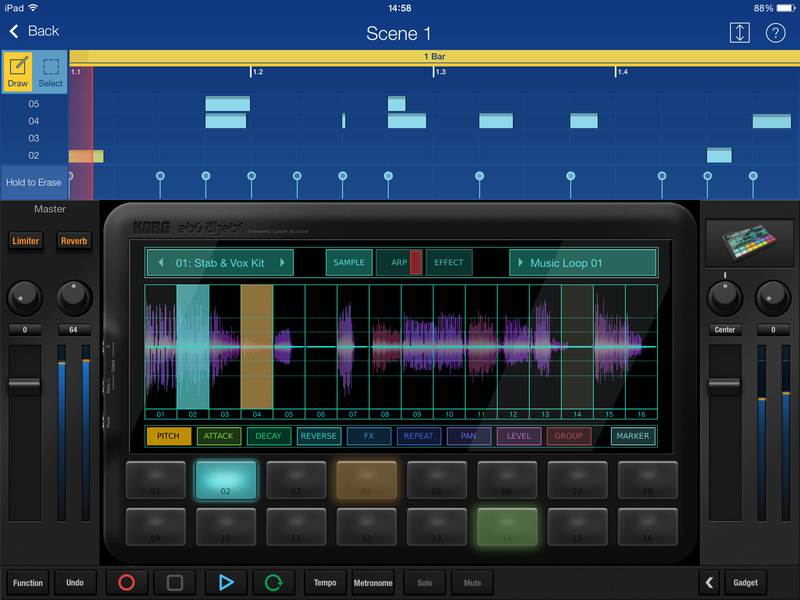 The standalone app comes with 15 “gadgets”, 3 of which are drum/sfx machines, and the rest various synths, covering a range of sounds. Each instrument is fairly specialised and focusses on achieving a particular sound e.g. Miami is a “wobble” bass-line synth and the Chicago gadget is a TB-303 synth with built-in arpeggiator. Each gadget can be operated easily on the iPad screen or using an external MIDI controller (with the iPad Lightning to Camera USB adapter). 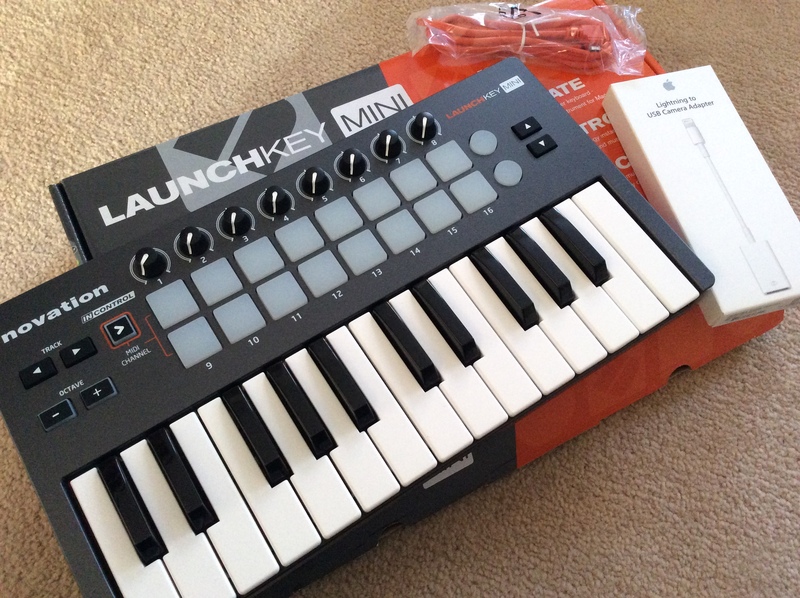 I’ll discuss this integration in detail in a future post, but I purchased the Novation Launchkey mini (which is entirely powered by the iPad for full portability). The app really comes into its own allowing you to map any gadget instrument controls to any of the controller knobs or play the drum machines using the velocity sensitive pads, etc. When controls are mapped, which may be different for each gadget, the software remembers the mapping, and each time you add a new gadget you can dive straight into making sounds and manipulating them with the keyboard, whether in the current project or new ones. Each gadget has a unique look and all are visually really appealing, the visual look of each gadget also reflects its function e.g. The “glassy” look of the Helsinki polyphonic ambient synthesiser and the “arcade” appearance of the Kingston polyphonic chip sequencer. All gadgets have the ability to apply different effects to the generated sounds, save your own presets and easily map MIDI controllers to various functions. Creating tracks is straight forward, you create the gadget of your choice, you determine the length of music you wish to record e.g. 4 bars, tap record, and record your music. I haven’t reached the limit on my iPad yet, but I believe it can handle 25+ tracks. On older iPads this is limited to 8. You can freeze tracks to limit CPU usage although I have not tried (or required) this feature. Gadget is 64-bit and optimised for new-gen iPads and iOS 8. Music can be sequenced manually using an on screen step-sequencer and piano-roll. All automation can be recorded, either at the initial recording stage or afterwards. Again this can be done manually with the MIDI controller or drawn in afterwards by hand. All the controls on each gadget can be mapped. Tracks are built by creating different gadgets and loops. These are then triggered in order. The sequencer can be a little awkward at times due to screen size (although I’m running this on an iPad mini 2! ), I’ve tried a few iPad sequencers and I feel this has one of the best user interfaces for music creation. The ONE major missing feature is…UNDO! Hopefully this will be added in a future update. All created tracks have a mixer strip automatically generated upon creation, it allows you to adjust changes in volume for each gadget, panning, solo/mute, the application of reverb via a bus and a limiter. All of this can also be automated to produce the final mix. London – drum module. Sequencing the drum sounds on a grid. Tap to add a note, tap to remove it. Marseille – polyphonic PCM synthesiser. This module includes a broad range of standard GM MIDI sounds. Chicago – tube bass machine. This is modelled on the classic 303 sound. So what can you do with the music once you have created it? You can upload it to Soundcloud or export as a .wav as expected, but one of my favourite features is the ability to export your work as a full Ableton Live project. This exports your work into loops which can be opened in Ableton, then manipulated further, for example adding further plug-ins, loops, Max, mixing, etc. If you use Ableton Live, this is a killer feature. I utilise the Korg Gadget as my “music sketchpad”, then open the projects up in Live to manipulate further. I’m currently using version 1.1.2 of the app, this is the most recent update as of writing. As far as I’m concerned the app is missing a few key features which would really perfect it. It would be nice to be able to import/record audio in app in someway (apparently this is on Korgs development roadmap), you do have a limited ability to do this when purchasing the Bilbao sample player and/or the Abu Dhabi loop slicer. These are in-app purchases, which considering the initial price of the app, are also slightly expensive at £4.99 each. I was weaned on very limited music equipment, to purchase the “hardware” to do this would cost thousands, so I still consider the extra purchases along with the software good value for money, although others may disagree with this sentiment. Another nice feature would be the ability to control other Korg apps e.g. the iElectribe drum machine. Korg Gadget also works with Korg Module, which again adds further instruments, if you own the Module app, the sound modules become “gadgets” in-app, it would be nice to see something similar with the iElectribe and other Korg apps. The beauty of software like this is it’s constantly developed and updated, hopefully these minor issues (including the missing undo!) will be added later. I tend not to splash as much cash on an app as this one, but after reading other reviews I treated myself, and I would say it’s worth every penny (including the in-app purchases). I hope Korg add more gadgets and continue to expand the software. Korg are well-known for their synths and they should be equally recognised for the amazing music apps they produce for iPad. If anything though, the app is fun, inspiring and allows for loads of creativity whether you’re new to music making or a seasoned pro.